Doctor Who is everywhere — again! My daughter gave me a heads-up about another mention of Doctor Who in the media; watch for it in the pilot episode of “Stitchers” on Hulu. What a wonderful world it would be if everyone followed his philosophy! Writing like that is one of the reasons I am such an avid fan of the show. Ever think Doctor Who is TOO much on your mind? 2 – If you saw the email address “dalekeyes@… ” would you think (as I did) Dalek Eyes? It was from someone named Dale Keyes…d’oh! Stop by Fandomania at the Deltona Library this Saturday for more of my geekiness, and pick up a Word Search Puzzle of the Twelfth Doctor, created just in time for the event. The 12th North American Science Fiction Convention was held July 6-9 in San Juan, Puerto Rico. At the “A Day in the Life of a Sci-Fi Fan” panel, Doctor Who was included in a list of suggestions for Must See TV. Doctor Who keeps popping up in the media, being mentioned on last week’s Big Bang Theory on CBS and this weekend’s Fresh Air with Terry Gross on NPR! Gotta post costumes for Halloween! 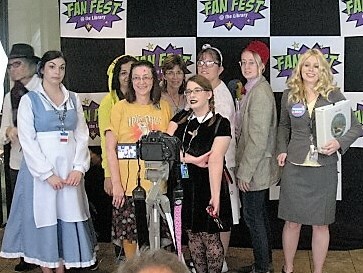 Here’s a photo of the staff at FanFest, the last library event where the Guardians tabled. Can you spot both versions of the Doctor?